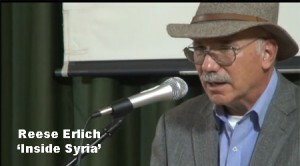 Reese Erlich presents “INSIDE SYRIA: The Back Story of Their Civil War and What the World Can Expect”. Based on first-hand reporting from Syria and Washington including interviews with both rebel leaders and Syrian President Bashar al-Assad, journalist Reese Erlich unravels the complex dynamics underlying the Syrian civil war. Disturbing and enlightening at once, this presentation shows us not only what is happening inside Syria but why it is so important for the Middle East, the US, and the world. The video begins with a four minute slideshow from Erlich’s trip to the region in August to observe the US bombing of Iraq and interview refugees fleeing to the Kurdish region. Reese Erlich’s history in journalism goes back over 40 years. He worked as a staff writer and research editor for Ramparts, an investigative reporting magazine published in San Francisco. Today he works as a full-time print and broadcast, freelance reporter. He reports regularly for National Public Radio, CBC, ABC (Australia), Radio Deutsche Welle and Market Place Radio. His articles appear in the SF Chronicle and GlobalPost. His television documentaries have aired on PBS stations nationwide. This entry was posted in Videos and tagged Reese Erlich, syria by PPJC Admin2. Bookmark the permalink.